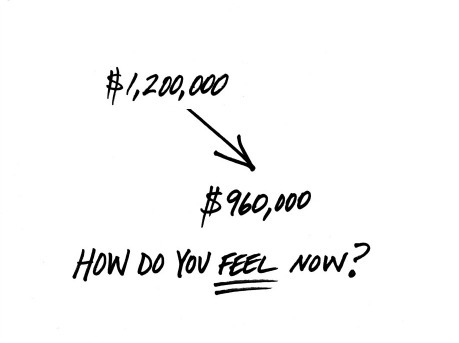 How would you feel if your position in an investment just dropped 20%? Would you like to switch topics? I’ll kind of switch topics. Boating through the Gulf Islands with a well-appointed boat and good weather makes a lifeboat drill so much easier. We’re not fighting waves, or rain or a fire in the hole. Having said that, if we’re in the middle of a storm and the drill becomes reality, at least we’ve rehearsed. We’ll all know exactly what to do. With markets moving along as they are, it’s a perfect time to have an investment “lifeboat” check. To get the most out of this drill, you need to recall how you felt in 2008 when things got nasty. Take out a piece of photocopy paper and in the top-left corner write $1,200,000. That’s what you invested. In the lower right corner, write $1,080,000 representing what you have left after a 10% decline. How do you feel? Just a market correction? Maybe it feels a little uncomfortable but you’ve been there before and not panicked. So why panic now? OK. Let’s move to lifeboat drill #2. Take out a piece of photocopy paper and in the top-left corner write $1,200,000. In the lower right corner, write $960,000 representing what you have left after a bigger 20% decline. How do you feel now? Just a market correction this time? Maybe things are more serious at 20%. Will you continue to be a buyer because you believe that things are on sale? Should you be greedy when others are fearful? Let’s move to the final lifeboat drill. A 50% market decline. From the market highs of 2007 to the market lows of 2009 the broad US stock market index dropped that much. Take out a piece of photocopy paper and in the top-left corner write $1,200,000. In the lower right corner, write $600,000 representing what you have left after a 50% decline. So now what? We know what many people did. They jumped overboard rather than getting into their lifeboat. Evidence-based investing shows us that time after time, markets recover. It’s just a matter of time. We’re not predicting market movements. That’s not what we do. But the one thing we learned from the 2008 crash is to educate our clients about the lifeboat drill. It’s a powerful concept to help clients stay the course and deal with reality when it hits them. If you have concerns about your lifeboat drill, let’s connect. Together we can build your lifeboat or make it safer for you. If there is a possibility that when the time comes you might have a hard time staying in the lifeboat you have now, this is the time to figure it out.